Hello Kitty Broom & Dust Pan - Lowest Price Ever! 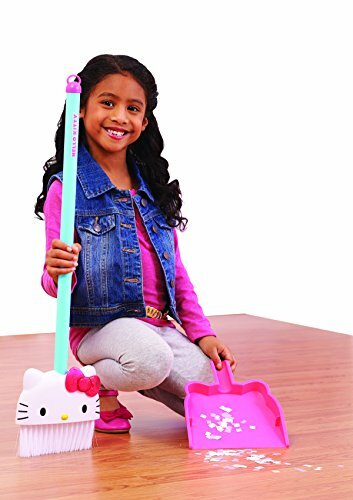 Home Amazon Hello Kitty Broom & Dust Pan – Lowest Price Ever! Hello Kitty Broom & Dust Pan – Lowest Price Ever! Get your young Hello Kitty fan to help with chore with this adorable Kids’ Broom & Dust Pan Set (on sale) on Amazon! Hurry and get the Hello Kitty Broom & Dust Pan today for $12.99 NOW only $12.99 from Amazon! Limit 3. This is the best price ever on Amazon. Check out all of the recent Amazon deals here! Adorable Hello Kitty child-sized broom with dust pan! It’s clean up time with Hello Kitty! Sweeping up has never been more fun or oh so cute as with the Hello Kitty Broom and Dustpan! The turquoise handled broom features the iconic Hello Kitty face for a broom head and a signature pink dustpan that fits snugly for storing. Who knew cleaning could be so cute. Buy the Hello Kitty Broom & Dust Pan from Amazon.